Every weekend we dig into the archives. This post was originally published back in September 2009. Road-building proponents often suggest that adding lanes to a highway will reduce greenhouse gas emissions. By easing congestion, they argue, new lanes will reduce the amount of fuel that vehicles waste in stop-and-go traffic, leading to lower releases of climate-warming gases from cars and trucks. Over the short term—perhaps 5 to 10 years after new lanes are opened to traffic—this argument may hold some slim merit. 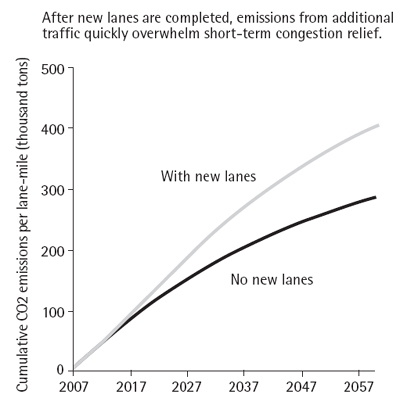 But considering the increased emissions from highway construction and additional vehicle travel, adding one mile of new highway lane will increase CO2 emissions by more than 100,000 tons over 50 years. One thing that seems to often be ignored in the calculation of CO2 emissions of a proposal are the resource that are used to build the thing in the first place. This study calculated that building one mile of roadway (at the width of a lane) would release between 1,400 and 2,300 tonnes of CO2, while its maintenance and renewal over time would lead to a further 3,100 – 5,200 tonnes of CO2 over the course of 50 years. Sightline (who did the study) conservatively estimated that constructing and maintaining a mile of roadway would emit around 3,500 tonnes of CO2 over the course of 50 years. Now obviously there are some benefits to CO2 emissions from reducing congestion – the benefits that we see picked up in the Waterview Connection study and the benefits picked up in many other international cost-benefit analyses I imagine. Putting aside induced demand for a moment, traffic which flows more freely will emit less CO2 per kilometre as the vehicles will not have to slow down, then speed up, then slow down, then speed up again. The more consistent running of the engine leads to better fuel efficiency per kilometre travelled for a vehicle, so therefore emissions are reduced. However, the study also indicated that once you start to consider induced demand, these benefits disappear fairly quickly. The study indicated that a mile of roadway would probably reduce CO2 emissions by around 7,000 tonnes over the course of 50 years (although once again that ignores induced demand for now). It is well documented that highway expansion can result in an increase in the number of vehicle trips on a roadway, particularly in congested urban areas. Indeed, accommodating additional trips is typically the point of adding new lanes to a highway. Still, the speed at which additional traffic floods new lanes often comes as a surprise. One recent California study estimated that more than roughly 90 percent of new lane capacity in congested urban areas is filled within five years after a project is completed. Other studies have found similar “induced traffic” effects from adding lanes to congested roads. Even assuming that vehicle fuel efficiency improves by 2.5% a year (which the study says is optimistic, considering that fuel efficiency in the USA has stagnated for decades due to their SUV craze), the new vehicle travel encouraged by the wider (or new) highway will result in 83,000 tonnes of CO2 emissions over the course of 50 years per mile of additional highway lane. Adding lanes—particularly on roads leading to low-density suburbs and undeveloped land on the urban fringe—tends to accelerate low-density sprawling development. Many studies have linked lower-density land use patterns with increased driving. In a sprawling suburb, virtually every trip must be taken by car, and everyday trips can require many miles of travel. In contrast, residents of more compact suburbs and urban neighborhoods typically drive less, and can walk or use transit for many trips, which reduces the carbon emissions from their daily transportation. Accordingly, low-density development is associated with increased vehicle fuel consumption. Sightline estimates that if as little as one-tenth of new highway trips represent a net shift to lower-density land use patterns (i.e., new sprawling suburban development with modestly higher per-household driving than in compact suburbs), then greenhouse gas emissions from additional off-facility driving could rival or exceed the increases from driving on the facility itself. To put this in a bit of context, let’s look at what effect this could have on the cost-benefit analysis of the Waterview Connection. I’ll take a total of 150,000 tonnes as a midpoint per mile, take the Waterview Connection as about 2.8 miles (4.5 km) long, and have it as a six lane highway. This would mean a “total lane miles” of 16.8. Multiply that out by 150,000 tonnes/mile and we can see that the Waterview Connection would result in an additional 2.52 million tonnes of CO2 being emitted over the next 50 years. At a cost of $100 a tonne (a reasonably likely medium-term level), that’s $252 million in costs that are just being ignored by the current analysis over 50 years. Hardly a $4.3 million benefit is it? Well the goods news, (if there is/was any) here, is that by the time the 50 years for Waterview are up, the bulk of the vehicle fleet will be electric. Meaning that the problem as such won’t get much worse that what is predicted. And if the fleet electrifies quicker than 50 years, the CO2 emissions will come down too. Also means future roading projects spouting “air pollution” benefits [from avoiding stop/go traffic] will be redundant as electric vehicle trains don’t pollute during stop/go traffic like fossil fuelled ones do. Of course by then the traffic engineers and planners will finally [and no doubt reluctantly] agree that yes induced demand does actually, in fact, exist after all. And the process is reversible so that if you can “induce” demand by building new roads, you can “reduce” demand by not building new/widening existing roads and instead investing in alternatives. I wish Twyford would read this. Particularly the stuff about the ‘off-highway’ or ‘indirect new traffic’. That traffic is stopping every progressive the move the government is attempting to make. It’s making access worse. It’s making safety worse. It’s making the environment worse. And it’s ruining the value-for-money of every project. It’s limiting our lives by congestion, too much traffic to enjoy our places, too much danger to let our kids have freedom. What happened was Supporting Growth: a huge waste of public money going into infrastructure including roads to create an ever-bigger city. That money should be going towards supporting infrastructure to create a denser, more people-friendly city that’s easier to get around. And then what happened was we got a Housing and Transport Minister who understands a lot of things really well, but has an absolute blind spot on this. Twyford: Supporting Growth is the problem. It’s the excuse for the roads. It’s the reason we can’t afford what needs to be done. It’s the reason the whole housing and transport sectors aren’t bothering to upskill and change direction. I would really like to see some data about the shape of the peak (e.g. how long peak traffic congestion lasts for) on the North Western in the evening heading west. I swear the traffic is building earlier and dissipating later. All well and good once you have your big piece of infrastructure, but I’ve seen not one piece of analysis from NZTA on the added congestion between the City and Westgate, just the ‘time saved’ from the other side of the tunnel. From there we could estimate the cost of the extra houses spent in traffic using the flow rates for SH16 and the tunnel and work out the emissions that are the direct result of the traffic induced by the tunnel (and the effect of it on all the other SH16 users). Meanwhile, somewhere at NZTA is a draft case study for light rail to Kumeu…. “We are applying the Making Room for Growth approach. And recognising that transport infrastructure is the most powerful driver of urban form. For me the most important thing is, “as long as development internalises the true costs of growth. ” Why should central Aucklanders pay the cost, now and forever for cheap housing that is scattered here, there and everywhere. If it is cheap for the purchaser, but expensive for others who will subsidise PT and future carbon costs then it is a short sighted approach. If development is along transit corridors that are PT transit corridors then it may have some merit. If in a couple of years there is a call to add a couple of lanes to the Northern or Southern motorway then it will have none. – Serviced by roads, sure… but the rapid transit’s not there, is it? Not even to the recent greenfields. They are simply developments that result in killer commutes, providing miserable livestyles, creating car dependency and high traffic everywhere. – The PT projects seem to be suffering from process gridlock. Would he be willing to ensure that any growing “out” will only happen AFTER the PT has caught up to where the existing greenfields are, and put in place for the new ones. – Who wants to live in a dense neighbourhood at the other end of a transit commute? The whole point of dense neighbourhoods is the freedom of being able to walk in any direction to lots of amenities, and the priority given to public place in such places, making it lovely… like those places in Europe that NZers spend money and carbon visiting every year and wishing NZ could be like that. – We cannot sprawl over any more farmland. That soil holds carbon, it filters water, it contains and supports biodiversity. Cities can have far, far lower equivalent ecological footprints than ours has. Sprawling further just gobbles up more of NZ. “We are drawing on our experience at Milldale…” ! I feel that if Millwater is the example then more cars will clog the Northern motorway and we will have more lanes added as is occurring at the moment and as occurred two years ago. As a result there will be much hand wringing about how there isn’t enough money to build all the PT infrastructure; and many of the people in Mil wherever will all whinge when the price of petrol inevitably goes up. The rest of us will still have the third most expensive PT in the world because the further zones are less well patronised and diminish the efficiency of the whole system. However if there was leadership that committed to growth only by means of PT solutions that ensured good ridership; local targeted rates for park and ride; and tolls that discouraged commuting all over Auckland that would seem a financially sensible proposition. the inside out city concept with density in the fringes and big stand alone houses in the centre is just lazy (or politically motivated) planning. NZers seem to associate density with slums – but this is only true in areas with low amenity and desirability such as the fringes. Anyone who thinks that building or widening roads decreases CO2 emissions is either an idiot or very biased. Hard to know which of these NZTA fits into. “One thing that seems to often be ignored in the calculation of CO2 emissions of a proposal are the resource that are used to build the thing in the first place”. The very same crazy logic could be applied to the Co2 emissions required to build a cycle way. Lets say the Skypath. Can you imagine how much CO2 is generated to make the carbon fibre, the polymars, the metal components, shiping the raw materials, construction etc etc. If you count things that way and divide the CO2 tones by the actual users of Skypath, it probably will have a bigger carbon footprint than the Southern Motorway. – a cycleway from scratch across farmland with the same capacity of people-flow. Do remember that cycles aren’t heavy and don’t require anything like the same base. – a way to add the same capacity to the same heavily congested urban road by reallocating general traffic space to cycleways. I’d love to see some science and analysis from you, David. Please don’t reply with opinion.